Salmon regulation: How should we do it? 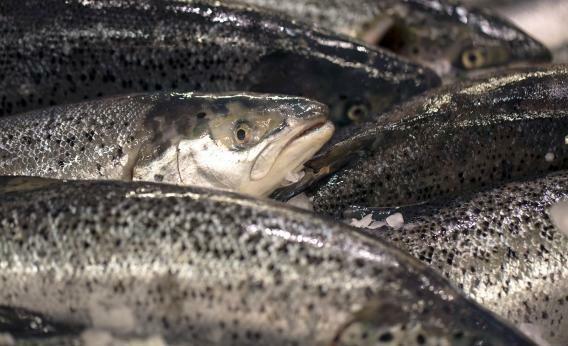 How Should Salmon Be Regulated? Norway’s farmed salmons are displayed at a supermarket, on December 21, 2012 at the Kremlin-Bicetre, outside Paris. Lord knows there are some dumb regulatory practices out there, but honestly if Schumpeter is so smart what’s the better way to handle this? The issue, after all, is not the salmon but the water. Rivers and lakes are the province of the Interior Department and the ocean is the province of the Commerce Department. One downside of dividing the regulatory pie up this way is that it creates a problematic situation regarding salmon. So is the solution to shift rivers out of Interior and into Commerce on the theory that it’s all water? Well then the problem is going to be that one agency oversees bears while they’re in the woods and another oversees them when they wade into the river. And in practice forest-to-river transitions are much more common than river-to-ocean ones, which is a good reason for drawing the line at the freshwater/saltwater line. Now another thing we could do is have one agency be responsible for the forests and the rivers and the oceans—call it a Department of Natural Resources. Great idea. Now the issue is that it’s a giant country with lots of water and lots of forests and you’re going to have to divide it up in various ways. One way would be to have a Freshwater Bureau that’s separate from the Saltwater Bureau. But then again the salmon problem pops up again. So maybe instead of functional divisions, the Department of Natural Resources should divide the country up along geographic lines. Now the problem is going to be that fish and wildlife don’t respect our bureaucracy’s map-drawing, and the same fish will be overseen by different regulators according to what latitude it’s at. None of that’s to say that we couldn’t improve on status quo salmon regulation. The Commerce Department really is a hodge-podge of miscellaneous functions that could probably be handed out in a different way. But the salmon issue isn’t some kind of blunder. It just reflects the fact that large bureaucracies—whether private sector or public sector in nature—need to make some choices about dividing up responsibilities. Any set of choices entails dealing with some edge cases. It’s tough. But absent a constructive suggestion, just pointing and laughing is silly. This is all pretty trivial, but elsewhere in the piece Schumpeter whines that Dodd-Frank contains “hundreds of bewildering pages” comprising “comprehensive instruction manuals rather than broad guidelines”. Well, guess what—the law is complicated because the financial system is complicated. If the rules weren’t precisely, people would be moaning that the law is too vague and creates too much uncertainty.